This plant was sold in a group of succulents. It overwintered on an enclosed porch in NM and is currently blooming. Is it a succulent? If so, any ideas as to its name? These are sold to plant into containers - especially hanging ones - and they love full sun and heat. It's not technically a succulent, but it kind of acts like one, and blends in perfectly, needing the same kind of care. I don't think I've ever heard it called anything else, but it does go by the name Million Bells, which makes sense. Those flowers are pretty distinctive, like bells, and they go crazy if you pinch off the dead ones. Obviously, New Mexico agrees with it! More here on an image search on Bing; Calibrachoa. 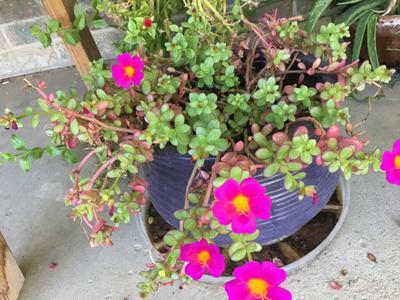 Looks like Portulaca (Moss Rose) to me, related to Purslane. Some portulaca's have leaves like yours, other varieties have a ferny appearance but are fleshier like a succulent. Lots of varieties available. I have the exact same plant and it’s not either of the two mentioned above. I’ve had mine almost a year and it’s starting to die. I’ve searched all over the internet trying the find the name of it and how to care for it. It’s one of the most beautiful and durable plants I’ve ever had.